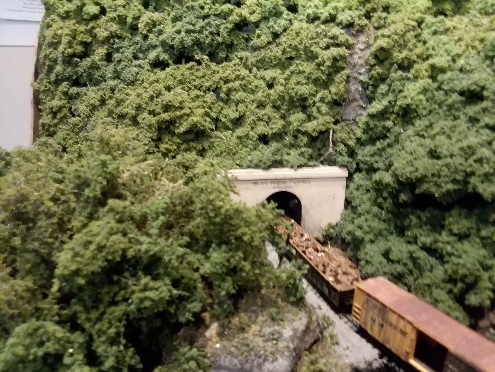 Brian’s N Scale C&O Mountain Subdivision has 80% completed bench work and sub roadbed, 100% completed backdrop, a section of track that runs on DC for the time being, and is just beginning the scenery process of planting about 70 gazillion trees. The layout was designed by Bernard Kempinski and is featured in his recent layout design book for Kalmbach. Layout dimensions overall 22' x 38' and include a staging "mole", a trip thru the restroom, and hidden furnace room staging. It models the present day Mountain Sub as though it was still owned by the CSX. (Buckingham Branch Line are actual present owners, with CSX trackage rights, and Amtrak 3 times a week for the New York-Washington-Chicago Cardinal.) The layout is dated 2005 and runs from roughly Charlottesville, Virginia through Clifton Forge to Covington, Virginia. The Mountain Sub is the highest point on the C&O, and offers Eastern Mountain railroading through areas of single tracking and a future large yard at Clifton Forge, and several large future industries including Lehigh Cement in Craigsville and the Westvaco Paper Plant in Covington. For more detailed information on Brian’s C&O Mountain Subdivision click here.